Q: What is Fenway Farms? 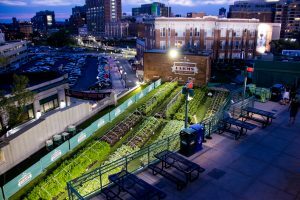 A: This 5,000 square foot rooftop farm within Fenway Park utilizes a milk crate container growing system. Harvested produce is served throughout the park, primarily in the Dell/EMC Club restaurant. 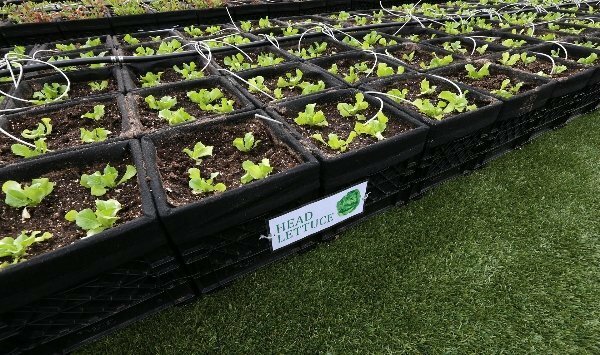 Fenway Farms was installed to further exemplify the Red Sox’ commitment to helping protect and preserve the environment and the neighbors around Fenway Park. Q: How did the Fenway Farms project come about? A: Fenway Park has a history of growing vegetables. Former bullpen coach, John Cumberland, grew tomato plants in the bullpen during the 2000 season. The installation of Fenway Farms marks the ongoing process to make America’s most beloved and oldest ballpark also one of America’s greenest. We feel a strong responsibility to act as a community leader to demonstrate the social, health, and environmental benefits of urban agriculture. Q: Where is Fenway Farms located? A: The farm is positioned on the roof of the Front Office located on the Third Base side of the EMC Level. Fans can observe the farm from the Third Base side of the EMC Level and State Street Pavilion Level. The Event Deck abuts the production farm space. Q: Can the roof hold the weight of the farm? A: Recover Green Roofs worked with structural engineers to design a system within the structural load constraints of the building while resisting environmental pressures such as wind uplift. Additional design features ensure waterproof protection and drainage to keep the building dry and the plants happy. A smart irrigation system minimizes water use and allows offsite monitoring of roof conditions. Q: Who maintains Fenway Farms? 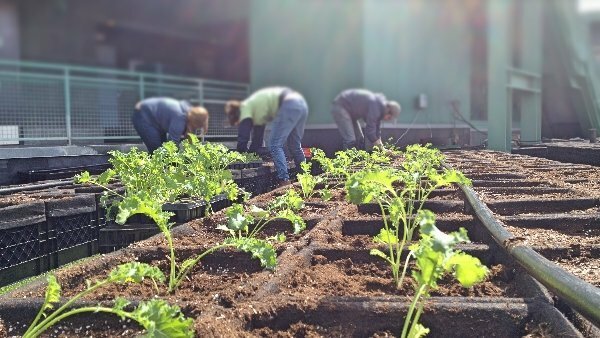 A: Urban farmers from Green City Growers maintain Fenway Farms regularly, including during many home games. Fans will often be able to see farmers at work. Q: What crops are grown? A: Crops are chosen by the Park’s Chefs each season. Spring crops include arugula, broccoli, broccoli raab, carrots, chard, chives, cilantro, collards, greens mix, kale, lettuce mix, mint, oregano, parsley, pea shoots, radish, rosemary, scallions, snap peas, spinach, strawberries and thyme, violas. The summer crops typically includes basil, beans, broccoli, chard, chives, collards, cucumbers, eggplant, flowers, hot peppers, kale, mint, oregano, parsley, rosemary, scallions, strawberries, sweet peppers, sweet potatoes, thyme, tomatoes and zucchini. Q: Where does the harvested produce go? A: Fenway’s EMC Club will serve food and drink made with more than 6,000 pounds of produce harvested from the farm throughout the season. Additional produce is used throughout the park’s restaurants, including in Press Box Dining and in general food concessions. Keep an eye out for the Fenway Farms salad bar, located at ground level concessions. The produce grown on the Vineyard Vines Deck event space is donated to the community via our food rescue partner, Lovin’ Spoonfuls. Q: Is the produce organic? A: Yes. Green City Growers uses only organic, OMRI-approved products and methods for fertility and pest management. Q: Is there a history of growing vegetables at Fenway Park? A: There is a rich history of baseball stadiums growing vegetables, starting with the Mets in 1969, and Fenway is no exception. The Red Sox’s former bullpen coach John Cumberland cultivated 18 tomato plants with basil in the bullpen in 2000. “We haven’t won since 1918,” said Cumberland in 2000, “so there’s the magic number. I’m trying to change the karma around here, get some sweet tomatoes and basil in the soil and change it. Hopefully, we’ll have a nice, bountiful crop by October.” The Red Sox famously broke “The Curse of the Bambino” by winning the World Series in 2004. Q: Is Fenway Farms be open to the public? A: The production farm is not directly open to the public, but is visible to fans from within the park. The Vinyard Vines Deck event space, which features over 600 sqft of growing space, can be rented out as part of group ticket sales packages, and for other non-game day events. The farm is also a stop on the Fenway Park tour. Q: Why is Fenway Farms important? A: This project serves to engage Red Sox Nation in the value of eating fresh food. Eating vegetables, especially those grown organically and locally, combats obesity and other common health issues. 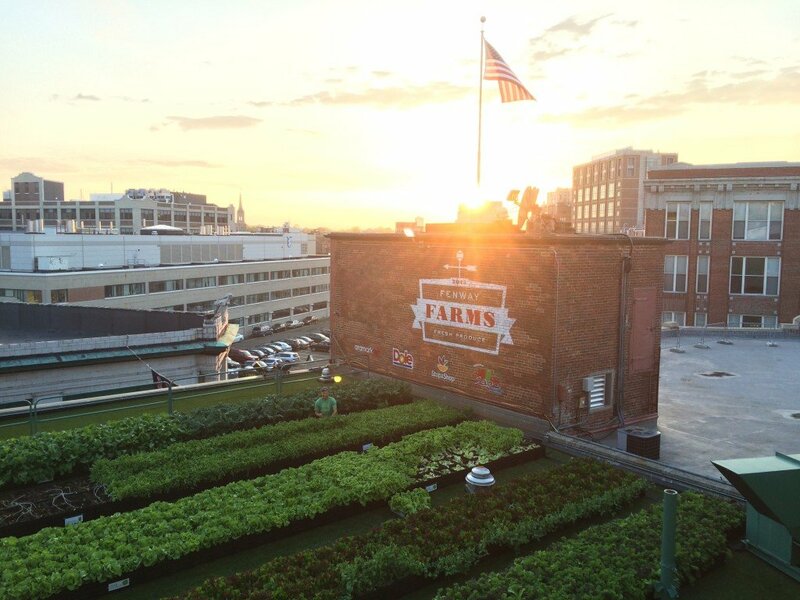 Fenway Farms represents the Red Sox’s commitment to health and wellness for both children and adults. We estimate that approximately 500,000 children and adults interact with Fenway Farms annually, helping to expose thousands to the food growing process, often for the first time in their lives.